What were some memorable H!P moments for you during this year? Which group really stood out to you this year? Did you gain any new favourite members? What were your favourite songs of the year? Any favourite memes/gifs? How was Hello! Project for you in 2017? Discuss all the things here! Of course, the biggest thing of the year for me is the flagship establishment celebrating their 20th anniversary. Morning Misosoup MV? Cried watching it. Ai no Tane? Same. As H!P fans, this is our 'Beatles at the Shea Stadium'...in fact it's already over 20 years, why hasn't Up-front Company registered & trademarked the word 'Musu-mania'? I actually also wasn't too affected by C-ute ending... 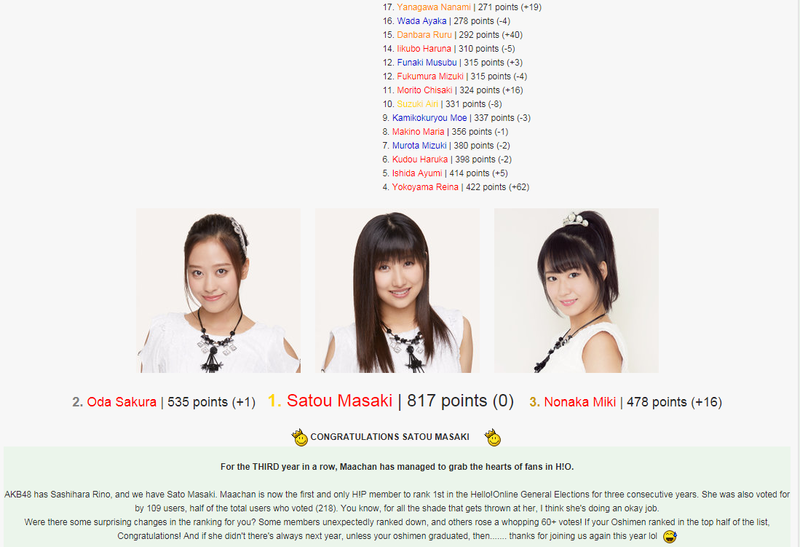 They didn't really have my fav members except for Airi who is still around. I was even in Japan when they disbanded and didn't even try to get tickets to see them The biggest impact is Maimi no longer being the leader of H!P, but such is the way of life. And I was also in tears watching the Momusu 20th anniversary things. Especially because Asuka has not at all wanted to affiliate herself with the past before; there were stories that she'd refuse to sing Momusu songs at karaoke etc. I'm glad to see that either with time she's come to embrace it or she's been compensated well enough for it to be worth it; Momusu is no longer a source of frustration for her it seems, but something she can gain something from. So that makes me happy. Also it is quite magical to see them together knowing how many of them are mothers now etc. A lot has happened in these 20 years, personally and professionally. ANOTHER COOL CONCEPT: Morning Musume'17 / Jealousy Jealousy ... Cool and relatable lyrics, and I loved the choreography especially when they all wore dresses where one side was a different colour, so at time they were the jealous ones or the targets of jealousy or both at the same time... Just symbolically a cool song. I still need to go do more iTunes shopping at some point... So much work. Oh yeah. Member additions were cool. Still can't comprehend Chiichan being in Morning Musume and been basically on cloud numbah nine all year because Kaedii is in Morning Musume. Kobushi Factory losses were tragic, but at the same time... It was their choice so I mainly feel sorry for the remaining members and not sorry about those who left. ANGERME seems to remain consistently awesome no matter who they add in, I am on an ANGERME high. - has grown on me in the past year, Now that the Album Ver. adds Maachan to the mix. I like it even more. - the best package of solid songs and awesome MVs out of all last years releases. They now seem like a really formidable group after a rough 2016. And Shuukatsu is my favorite MV as well. Maria Makino: Probably won over a lot of casual fans by appearing on the cover of over a dozen mags. Gotta be a record of some sorts. As entertaining as the classic H!P variety appearances. Takeuchi could carve out a future in variety by telling stories about the struggles of the 2nd gen.
Nanami Yanagawa - her cuteness stands out even more now that she's in more "mature" group. and Mao Akiyama, Saori Onoda, Momona Kasahara - future H!P superstars, buy low. 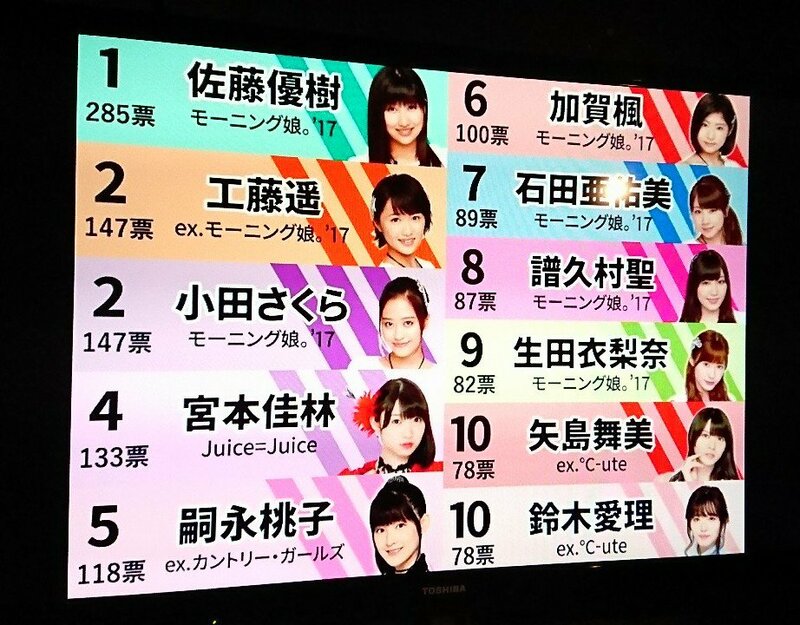 Oh, and Maachan dominated the year end popularity polls yet again. Threepeat! Another reason I wasn't too shaken by C-ute's disbanding was due to the strength that Kobushi Factory has displayed since their debut, but, to be honest, I was scared when members started leaving...but it seems that we've been left with the 5 best members whom also seem to be in it to win it, and I hope they leave the magnolia's as a 5 member group. to say that I am pleased with 13th gen is an understatement.